The FS62 – Strain Sensors are Fiber Bragg Grating (FBG) based sensors, designed to be bonded to surfaces and materials, spot welded to structures and components, attached or directly cast into concrete wet mix. Possible adjustment to further compensate for the thermal expansion of a given structure, thereby enabling stress and load-induced strain components to be measured. Inherent immunity to all electromagnetic effects (EMI, RFI, sparks, etc.) and safe operation in hazardous environments. Connection of a large number of sensors to a single optical fiber, reducing network and installation complexity. Large distance between sensors and interrogator (several kilometers). Provided with calibration sheet, allowing easy and accurate configuration. Based on the measurement of an absolute parameter – the Bragg wavelength – independent of power fluctuations. 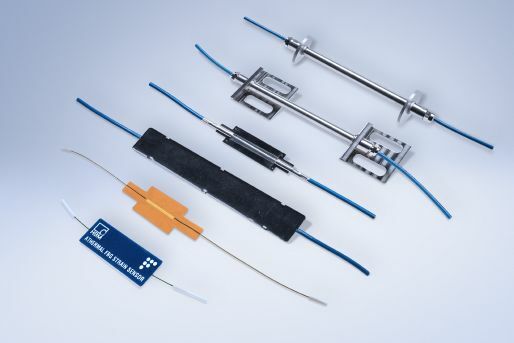 HBM FiberSensing strain sensors can be used in several strain measuring applications. They are particularly suited for structural health monitoring in large structures (SHM).